The release of the list of artists to be included in the Whitney Museum of American Art’s inaugural show at its new downtown space in New York City was widely anticipated in the art world. An article that lamented the dearth of Latino artist sparked controversy. This news came on the heels of the revelation a week earlier that almost one third of major solo shows in U.S. museums go to artists represented by just five galleries. (More on that later.) Meanwhile, the name of the Whitney’s extravaganza, “America Is Hard to See,” is, perhaps, more appropriate than the curators could have imagined. The article appearing on the arts blog Hyperallergic alleged that despite being 18 percent of the population nationwide, Latinos accounted for just 4 percent of the represented artists in the Whitney exhibition. The next day, the list of the artists included was released. I got out my red pen and circled the names of the artists I believed fit the bill. All I had to do was find 16 names to get to 4 percent. My initial list consisted of: Cory Arcangel, ASCO, Luis Camnitzer, Miguel Covarrubias, Rafael Ferrer, Wayne Gonzales, Felix-Gonzalez-Torres, Carmen Herrera, Lee Lozano, Marisol, Gordon Matta-Clark, Ana Mendieta, Jose Clemente Orozco, Rafael Montañez Ortiz, Alfonso Ossorio and Lari Pittman. I got in touch with Chon Noriega, director of UCLA’s Chicano Studies Resource Center. He pointed out that Lee Lozano was formerly Lee Krasner (Jackson Pollock’s widow), that Alfonso Ossorio was Filipino and that he was not sure if Arcangel was Latino. That meant that to get to 16 Latinos, ASCO had to be counted as four artists (Patssi Valdez, Gronk, Willie Herron and Harry Gamboa, Jr.). That might seem fair as far as it went. But in reality, we are talking about images on the wall of one of America’s most venerable museum, so the more accurate way to count true representation was to count the number of works in the show by Latinos. The Whitney did not say how many works were in the show, except to say it was more than 600. The L.A. Times reported “nearly 650” works in the show. Assuming just 630 works, and that Latinos will be represented by just one work each (a safe assumption) then 16 divided by 600 equals just 2.53 percent. 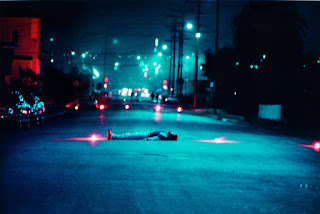 Of these works only three out of the over 630 are by a Chicano artist: Harry Gamboa, Jr.’s photographs, No Canary (1972), Decoy Gang War Victim (1974, pictured above) and No Movie (Stars) (1978), all listed as ASCO creations. Following the math to its natural conclusion, this resulted in an actual representation of the largest Latino subgroup in this country in the “America is Hard to See” exhibition of only .47 percent since this works as three of 630. The same could be deduced from the five galleries’ lists. Of the six artists on the combined lists of the five galleries all were from Mexico or Latin American, and would not ordinarily be defined as Latino—or Chicano, for that matter. That means there is no Chicana or Chicano representation among the feeder galleries to the major museums. The Whitney states on its website that the title seeks to celebrate the ever-changing perspectives of artists and their capacity to develop visual forms that respond to the culture of the United States.” Yes, that monolithic, uni-linear, monochromatic culture that has been the hallmark of American museum offerings for generations and which continues to ignore the ever-growing rest of us—that must be what the curators mean. The Afrikaner term “apartheid,” which originally referred to the separation of whites and blacks in South Africa, has come to mean various forms of extreme exclusion, including social and urban apartheid. It is time to add “art apartheid” to this list. In light of the bare facts surrounding the Whitney’s abysmal numbers there can be no more appropriate term to describe this lack of representation of such large segments of the population. America is indeed hard to see when so much of it is excluded, marginalized and ignored.